This course is aimed at Health & Safety Managers, Managers of buildings and building trades, Plumbers, Electricians, Painters & Decorators, Gas Fitters, Cable Layers, Demolition Workers, Plasterers, Heating & Ventilation Engineers, Roofing Contractors, Fire & Burglar Alarm Installers, and General Maintenance Staff. 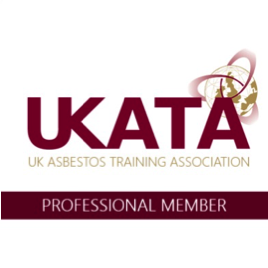 We are a registered member of UKATA, and we deliver UKATA approved training courses. Candidates will take a short written test, and receive a course handout summarising the topics covered. Successful candidates will receive a UKATA certificate.